Welcome to the California Smokers’ Helpline website. The California Smokers’ Helpline is a telephone program that can help you quit smoking. This website is operated and managed by the University of California, San Diego Health Sciences under grants received from public agencies. California Smokers’ Helpline services are free and funded by the California Department of Public Health, the California Tobacco Control Program (CTCP), and by First 5 California. The Helpline has been in operation since 1992. All health and health-related information contained within the California Smokers’ Helpline website is intended to be general in nature and should not be used as a substitute for medical treatment by a health care professional. Your health care provider should be consulted regarding matters concerning the medical condition, treatment and needs of you and your family. The California Smokers’ Helpline respects the privacy of its users. Our goal is to provide you with a personalized Internet experience that delivers the information, resources, and services that are most relevant and helpful to you. In order to achieve this goal, we sometimes collect information during your visits to understand what differentiates you from each of our other users. To demonstrate our commitment to your privacy, we have prepared this statement disclosing our website privacy practices. California Smokers’ Helpline collects certain information from and about its users in two ways: directly from the user and from our Web server logs. Web servers typically collect, at least temporarily, the following information: Internet Protocol (IP) address of computer being used; web pages requested; referring web page; browser used; date and time. California Smokers’ Helpline may collect statistics identifying particular IP addresses from which California Smokers’ Helpline websites are accessed. The California Smokers’ Helpline enrollment processes require users to provide limited personal or professional (demographic) information, such as your name, organization, position, telephone number and email address for purposes of providing information and follow-up resources. The information is used to process requests for information, and to provide counseling calls and follow-up contact with further resources to help you quit smoking or to help someone else quit smoking. California Smokers’ Helpline may also use personal or professional information for the purpose of future communication on new offerings, but only if the opportunity to opt out of that type of use is provided. 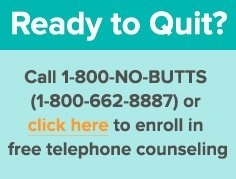 If you would like to update your personal information or stop receiving communication from the California Smokers’ Helpline, please call 1-800-NO-BUTTS or 1-800-662-8877. If you have any questions about this privacy statement, you can contact the Web Services Team at cshoutreach@ucsd.edu. Official UCSD Web Sites display the UCSD Seal for Official Web Pages at the bottom of their main page. Only Sites bearing the UCSD Seal for Official Web Pages are Official UCSD Web Sites. All other Sites hosted by UCSD servers are not official, including personal Web Pages of students, faculty, and staff, whether or not they are carry a disclaimer. Unofficial Sites do not represent the University in any way. Any content contained or accessible from unofficial Web Sites does not reflect the views of the Regents of the University of California and the Regents do not endorse, warrant, or otherwise take responsibility for the contents of unofficial Web Pages or of any material accessible from unofficial Web Pages. The California Smokers’ Helpline is NOT an official UCSD Web Site.